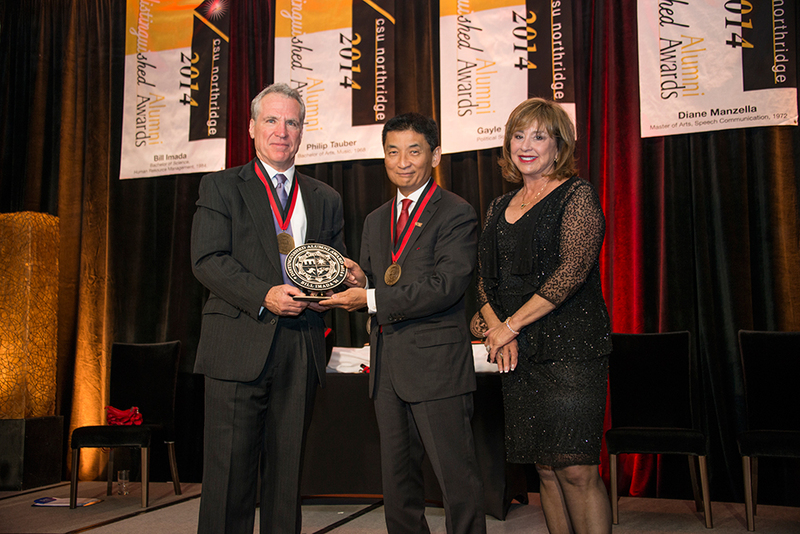 Grant Ashley, Bill Imada and CSUN Alumni Association President Francine Oschin after Imada received his plaque. Photo by Lee Choo. George Leis, Gayle and Philip Tauber and Oschin. Photo by Lee Choo. Governor Linda Lingle, Diane Manzella and Oschin. Photo by Lee Choo. 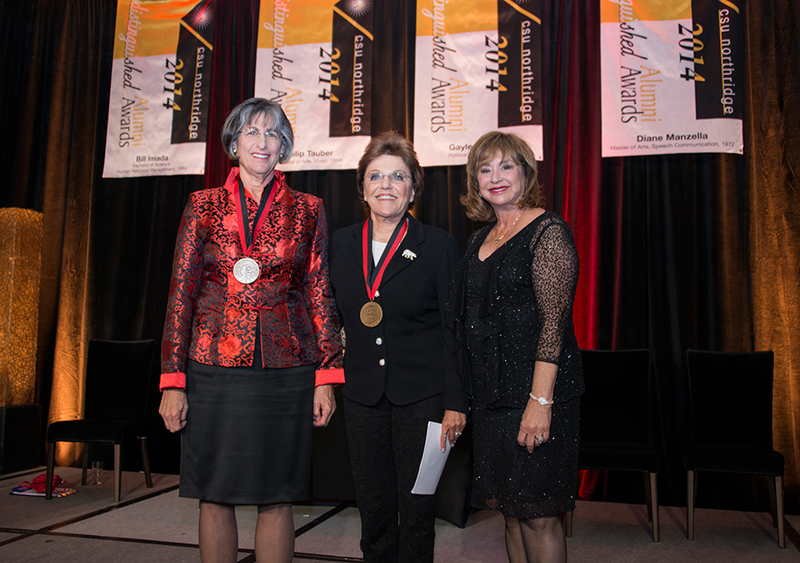 CSUN President Dianne F. Harrison addressed the audience during the Distinguished Alumni Awards on April 26. Photo by Lee Choo. Emcee Felicia Conlan introduced the honorees. Photo by Lee Choo. 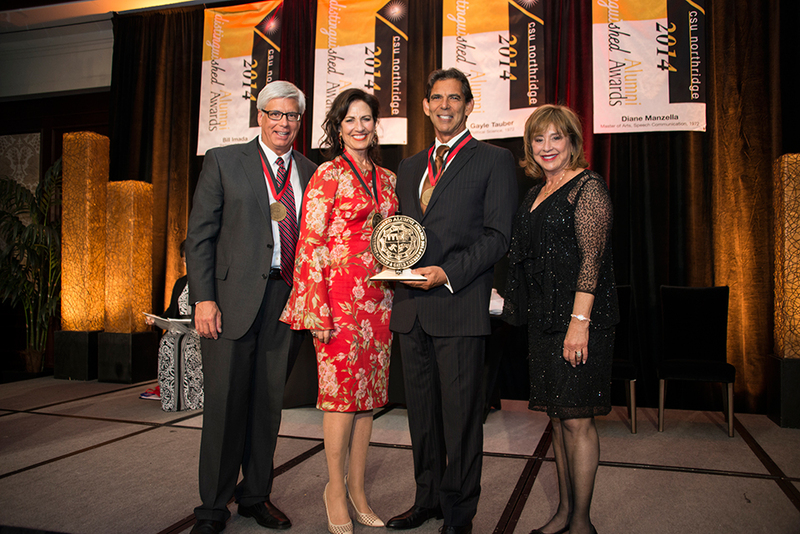 California State University, Northridge celebrated four of its most accomplished graduates at the 2014 Distinguished Alumni Awards on April 26 during a gala event at the Four Seasons Hotel in Westlake Village. 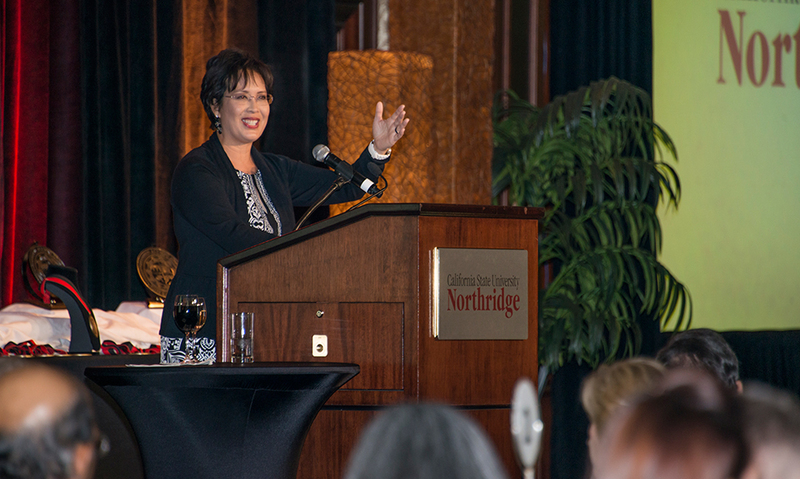 The annual event, now in its 16th year, commenced with CSUN Alumni Association President Francine Oschin ’84, M.A. ’85 introducing the honorees: IW Group Chairman Bill Imada ’84, Gardner Manzella, Inc. Co-Founder Diane Manzella ’72, and Philip ’68 and Gayle Tauber ’72, the founders of the Kashi Company. 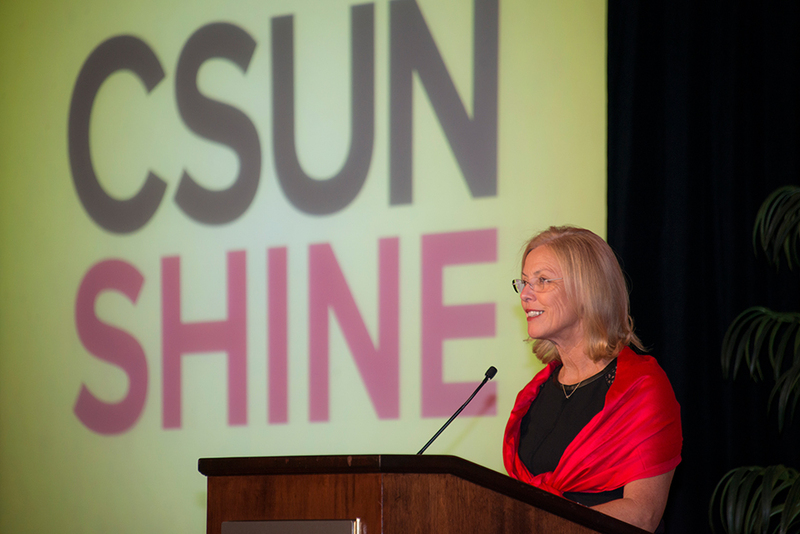 In her keynote address, CSUN President Dianne F. Harrison added some background about each of the honorees, as well as some amusing anecdotes. She also encouraged everyone in attendance to take a look around the room because surrounding them were CSUN alumni who were successful in a varied number of fields. Each of the honorees expressed gratitude to the university for giving them the start to what would become very successful careers, and recognizing them for those successes. They also pointed out how important their CSUN educations were in giving them a well-rounded experience during such crucial years of their lives. During his college days, Imada was the CSUN Associated Students president in 1979 and graduated with a degree in human resource management. He founded the IW Group, one of the foremost minority-owned and operated advertising, marketing and communications agencies. Imada pointed out that as thankful as he was to receive this honor, he was just as happy to give back. Imada also noted that he wants to join other distinguished alumni as examples for students today and in the future. Manzella received her M.A. in speech communication from CSUN and returned to teach at the university for five years. She also met someone who would become a great friend and colleague: Julie Gardner. Together the pair started the company Gardner Manzella, which was originally focused on treating children with speech and language disorders. The company quickly grew in size, stature and reach, in time expanding to 12 states with more than 350 employees, many of them CSUN graduates. In making Gardner Manzella so successful, the founders did not realize they were breaking down barriers. Even with so many people keeping tabs on and celebrating their successes, Manzella remained extremely grateful to her alma mater for the continued association. Today, she is very active with CSUN, serving on the Dean’s Circle for the College of Health and Human Development. The Taubers may now live in San Diego, but they still proudly identify themselves as San Fernando Valley natives. The couple met during their years at then-San Fernando Valley State College, and a slide presentation during President Harrison’s remarks featured a photo of the bench on campus where Philip proposed to Gayle in 1967. Displaying great entrepreneurial spirit, the Taubers launched several businesses. Avid fitness and nutritional practitioners, their most successful endeavor was the Kashi Company and its line of ready-to-eat cereals and cereal-based products. Kashi products became very popular with people trying to eat healthy, and the Taubers eventually sold the company to Kellogg’s in 2000. When they found out about the Distinguished Alumni Award honor, they were as humbled as anything else. “It’s a great validation that Valley kids can make it on an international basis, based on a public education,” Gayle said. “And it’s full validation of the importance of public education, that the story of success can and should happen. With so many business accomplishments in their lives, the Taubers now find satisfaction in helping guide young people in their own respective careers. In every way, the four honorees at this year’s CSUN Distinguished Alumni Awards show that kind of character and are fine examples for students today to emulate in the future.